London 1950: a father makes the heart-wrenching decision to send his children to New Zealand for a better life. Young Pat and one of her sisters are allowed to stay together when the four are adopted out, but they will never see their father again. Many years after coming to New Zealand, Pat and her sister are reunited with their brother and sister and one other sister that didn't travel to New Zealand with them. Home Child hauntingly captures the experience of young children consigned to a new life in a strange country, with its sadness and also happy times. 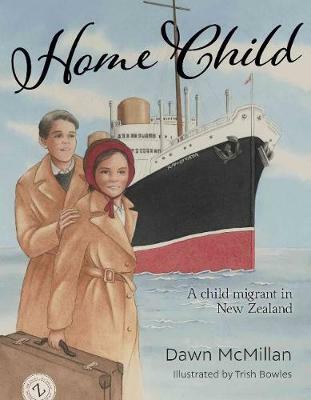 Included is biographical information about Pat and her tireless work for child migrants in New Zealand, and an explanation of the history of the thousands of children that were sent all over the world from England. In 2010 Nelson resident Pat Brown represented New Zealand at the British Government's official apology to child migrants. This is her story. Dawn McMillan is the much-loved author of numerous children's books including the international hit I Need a New Bum! In this emotion-filled story she shows her writing talent is not restricted to humour. Dawn has meticulously researched the story and developed a friendship with Pat. Trish Bowles is a wellrespected and widely published illustrator. She lives in Christchurch.